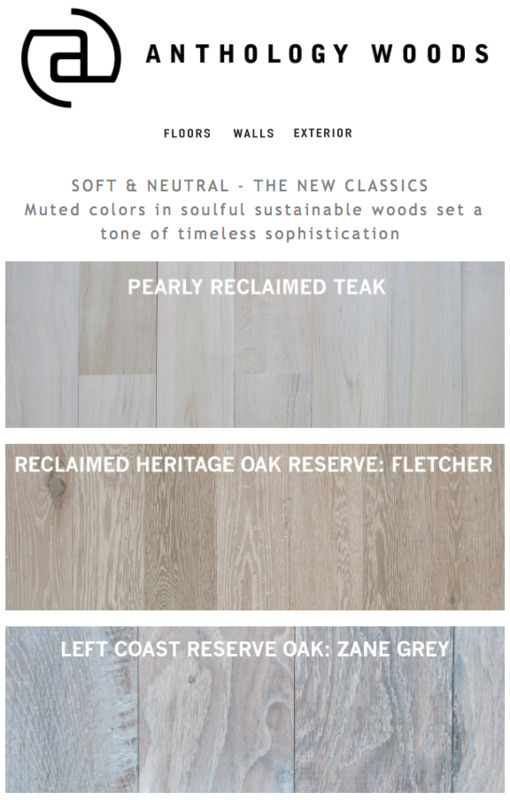 In case you missed our recent email announcement about our white-washed wood collection, here it is! We're so excited to share these gorgeous looks in reclaimed and sustainably sourced woods with you, and will be happy to support your projects with these distinctive wood looks. Pearly Teak is a solid reclaimed white-washed wood suitable for vertical services like walls and exterior siding, as well as ceilings & soffits. It is 100% post-consumer reclaimed, and with the heavy white wash looks amazingly refined & sophisticated! Ask us about a similar product for flooring, as well. Reclaimed Heritage Oak Reserve: Fletcher is a blend of Red & White Oak with a fumed body, wire brush, and multi-step white washed finish. The finish softens the look from antique rustic to a more muted, refined & relaxed appearance. At home in a classic chateau as well as a Manhattan penthouse. This look is available both solid and engineered for flooring, walls, and ceilings, and a range of widths may be specified. if you prefer a cleaner look, it can be provided on new wood, too. Left Coast Reserve Oak: Zane Grey begins on flat-sawn (aka plain-sawn or European-cut Oak) Oregon White Oak, prized for hardness & durability (it is about 25% harder than standard Oak). A fuming treatment reacts with the natural tannins in the wood to produce the gray and tan tones, and finally we finish with a natural white oil finish. Available solid or engineered, with certified wood as an option. Click on the image to see the full post, and please contact Anthology Woods if you'd like more information about these products!